"I'm very touched that my songs are played in flamenco style. Nobody has performed my songs in this way before!" - Leonard Cohen in El País, December 1996. This is a Spanish tribute to Lorca and Cohen in Flamenco style. 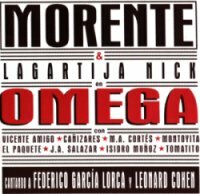 Enrique Morente is a famous Spanish flamenco artist who met Leonard Cohen in Madrid in 1993. With this album, Morente wants to remember their friendship. Several outstanding Flamenco players -perhaps the best- were also invited to play: Vicente Amigo, Cañizares, M.A.Cortes, Montoyita, El Paquete, J.A.Salazar, Isidro Muñoz, Tomatito..
Lagartija Nick is a group of four musicians: Antonio Arias (bass), M.A.R. Pareja and Juan Codorniu (electric guitars) and Erik (drums and percussion). All songs were recorded in Granada, Sevilla and Madrid in September-October, 1996. The songs are full of life, rhythm and love. Even Phil Spector would love this sound wall! Lyrics by Federico García Lorca, music by Leonard Cohen. Here we have the original Spanish Lorca's poem, which was translated by Cohen for his song "Take This Waltz". Enrique Morente sings. Musicians: Tomas San Miguel (accordion and keyboards), El Bandolero (cajon), Javier Losada (bass), Jose Antonio Galicia (percussion). Cohen's lyrics translated by Enrique Morente and Alberto Manzano. Music by Leonard Cohen. Estrella Morente and Enriquee Morente, vocals. Canizares, flamenco guitar. Aurora Carbonell and Estrella Morente, clapping. Cohen's lyrics translated by Enrique Morente and Alberto Manzano. Music by Leonard Cohen. Enrique Morente, vocals. Tomatito and Montoyita, guitars. Tino di Geraldo, cajon. Las Negri, Aurora Carbonell, Enrique Morente, Estrella Morente, chorus. Antonio Carbolenn and El Negri, clapping. Cohen's lyrics translated by Enrique Morente and Alberto Manzano. Music by Leonard Cohen. Enrique Morente, vocals. Lagartija Nick, the band. Vicente Amigo, flamenco guitar. Tino di Geraldo, cajon. Las Negri, Aurora Carbonell, Enrique Morente, Estrella Morente, chorus. This album was issued in Spain in 1996 by El Europeo Musica. Cat. # EEM 001. Use this link to KCWR Radio to hear Morente's "Aleluya# 2" and "First We Take Manhattan" in RealAudio and Cohen's comments! Make a search for Leonard Cohen. and Martin Rupps who was the first to find the album! Enrique Morente's b/w photo from El País/EFE, January 12, 1997. Photo on the left: Enrique Morente meets Ms. Esther Cohen in New York (November 2003). Photo © Robert Bower. Used with permission.